Business owners seeking to grow their business have a unique opportunity through the 2019 Oklahoma Emerging Leaders Class. Local area recruitment is now open for the class which has helped numerous businesses across Oklahoma expand. 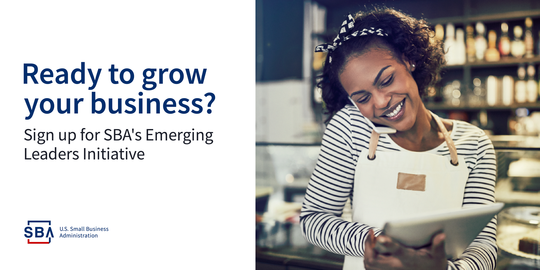 Interested small business owners can learn more regarding eligibility, how to apply, and class schedules at the SBA’s Emerging Leaders website. The Oklahoma District Office of the U.S. Small Business Administration will hold its 2019 Emerging Leaders executive-level intensive entrepreneurship training initiative for small business owners at Rose State College beginning in April. An informational session featuring a past graduate of the program will be held March 13th from 2-3:30 pm at the Rose State College Professional Training Education Center, 1720 Hudiburg Drive, Room 213, Midwest City, OK 73110. The Small Business Administration’s Emerging Leaders initiative provides free entrepreneurship education and training for executives of small, poised-for-growth companies that are potential job creators. This intensive executive entrepreneurship series includes nearly 100 hours of classroom time. It also provides opportunities for small business owners to work with experienced coaches and mentors, attend workshops, and develop connections with their peers, local leaders, and the financial community.